Sailing and snorkeling around Zanzibar. One of the best travel days of my life – seriously! Tanzania is known for many things: the Serengeti, Oldupai Gorge, Ngorongoro Crater, the Maasai people, Mt. Kilimanjaro, and the amazing spices of Zanzibar, to name a few. What you may not realize is that the diving, sailing, and snorkeling are just as breathtaking. Due to some health issues, Dario and I were unable to complete the climb of Kilimanjaro as we'd planned. We requested that our tour outfit arrange some other activities for us while we waited to meet another member of our party on Pemba, the lesser known of the two big islands that make up Zanzibar. They arranged for us to stay at a new resort that was looking to boost business, and to go on some tours. Safari Blue was one of those tours and we had no idea what to expect. With that said, everything else was beautifully planned and executed. 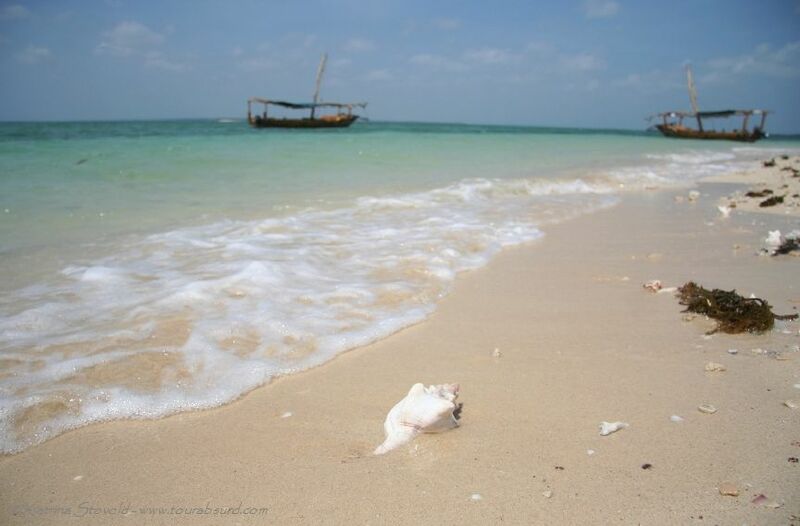 First activity was simply sailing in the dhow and enjoying the cerulean swells of the Indian Ocean with a lovely breeze complementing the golden African sun. We were on our way to snorkel around a coral reef! Our first stop was at a small sandy island bereft of plant life, one that apparently disappears during high tide. Staff members of the Safari Blue team hopped out of the boats and quickly unloaded crates containing masks, snorkels, and fins in a well-rehearsed dance. Our host and guide gave us a brief lecture about not touching the coral, as human touch will kill the living coral instantly. He said that no matter how many times he issues this warning, there are people who would insist they were tired, or wanted to get a better picture, and just stand up on the coral. A shame, because it's so amazing to be able to paddle around so close to one of nature's wonders! He then asked if there were any in the group who had not been snorkeling before. I had, but Dario hadn't, and one or two others of the group had not. We swam with him, while other groups swam with different staff members. Turns out Tanzanians are pretty savvy about the tourist industry – our guide spoke a little Italian to Dario! Swimming in a tropical fish tank. I was fiddling with the waterproof camera I'd bought just for this trip when I realized I'd fallen behind our little group. There was a bad moment when I found myself surrounded by ghostly white jellyfish. I screamed at the top of my lungs to get Dario's attention. He got our guide's attention, who told me there was nothing to worry about: these jellyfish don't sting! He proved his point by scooping one out of the water, holding it in the air, then tossing it back in. (Must have been one confused jellyfish!) I was still wary of the little buggers, but much relieved. I passed through the wall of the wee sting-less things and caught up to the group. Back in paradise! We returned to the small island after a satisfying paddle to find that staffers had set up temporary shade structures and were handing out fresh coconut! First you drink it, then you eat it! 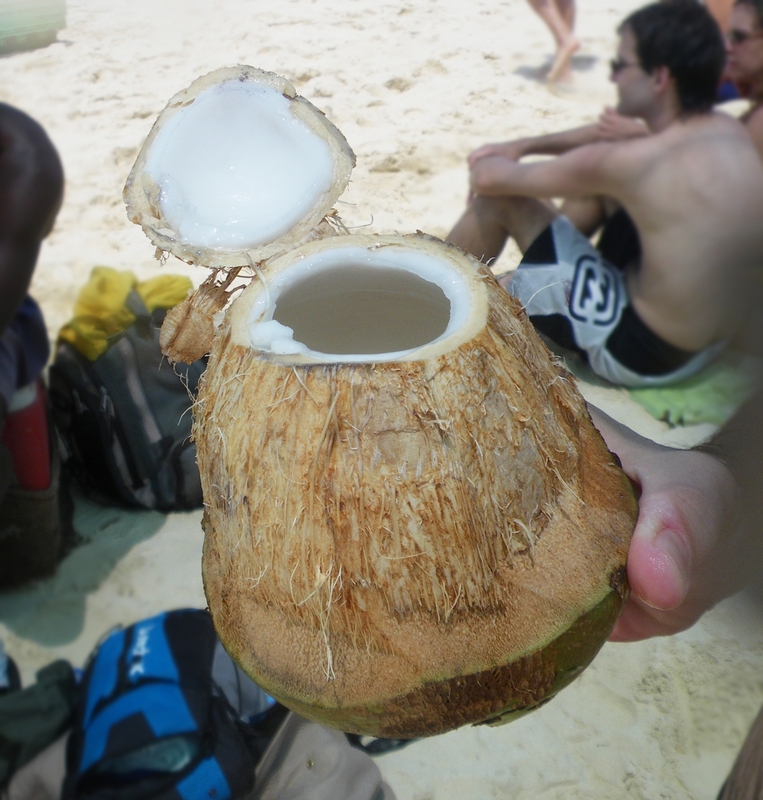 After refreshing ourselves with coconut water and coconut flesh (the white inner part of the fruit), we hopped back in the dhows to go dolphin watching. 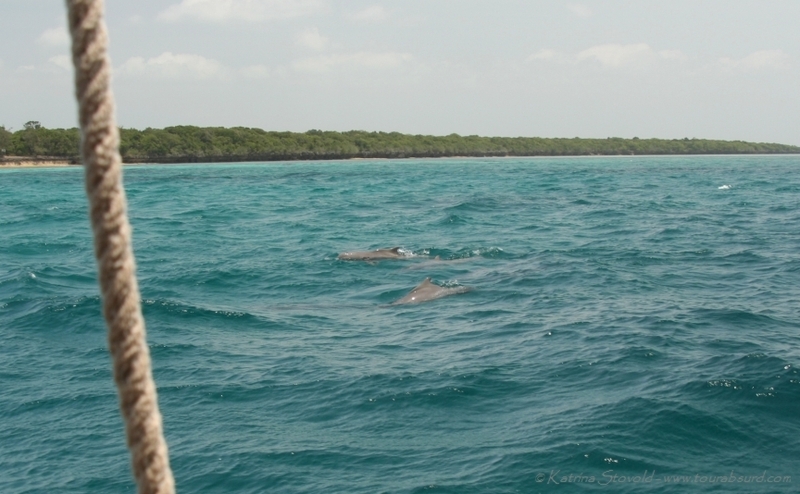 Our sharp-eyed captain (the aforementioned host and guide) soon spotted some humpback dolphins. (Yes, dolphins!) They were a bit shy, so we only caught glimpses of them, but we did see them. Do you suppose one of them is named Igor? 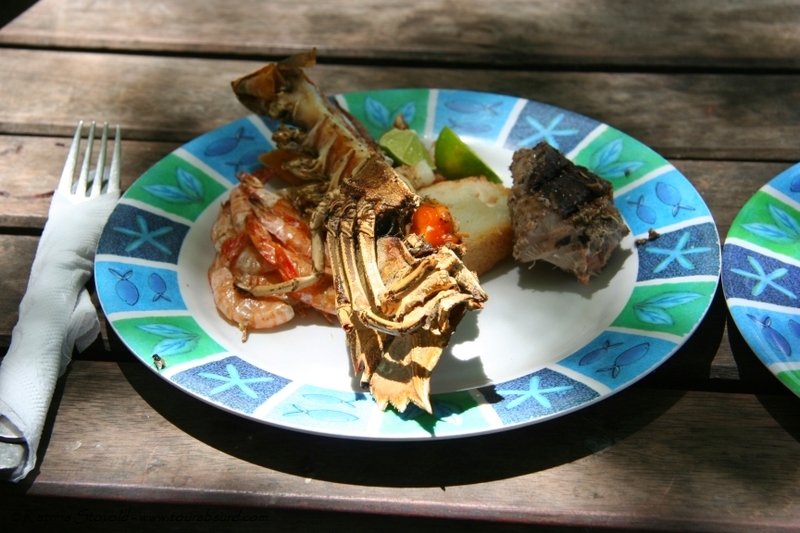 And then it was off to Kwale Island for lunch! Just as the website – seen after the fact – promises we had a lovely meal of freshly grilled lobster, fish, rice, sauce, and beverages. Lobster on the half shell, anyone? We got a mini tour to see a giant, toppled baobab tree in the center of the island. A big storm had knocked it over some years previous, but it was still growing. Then there was a bit of leisure time to stroll and swim, or in my case take photos. At some point we had a demonstration, of sorts, introducing us to many of the fruits that grow in Zanzibar. 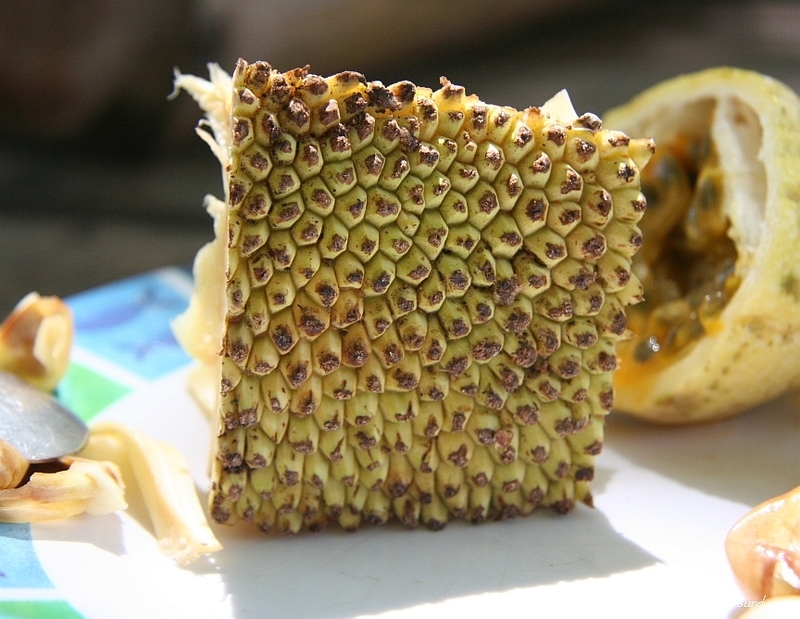 There were some that were familiar – like passion fruit and mango – and some that were completely new – like jackfruit, which has an odd, sticky combination of banana and pineapple flavor. We all got to sample each of the fruits. I liked the jackfruit, but Dario didn't care for it. He liked papaya more; I preferred the mango. We both loved the pineapple, however. Never before, and not since, have I encountered pineapple as delicious as that which we had in Zanzibar. It is now the standard against which all future pineapples will be judged! Jackfruit skin looks like millions of tiny mini-bananas! And yet the day's activities still were not finished! 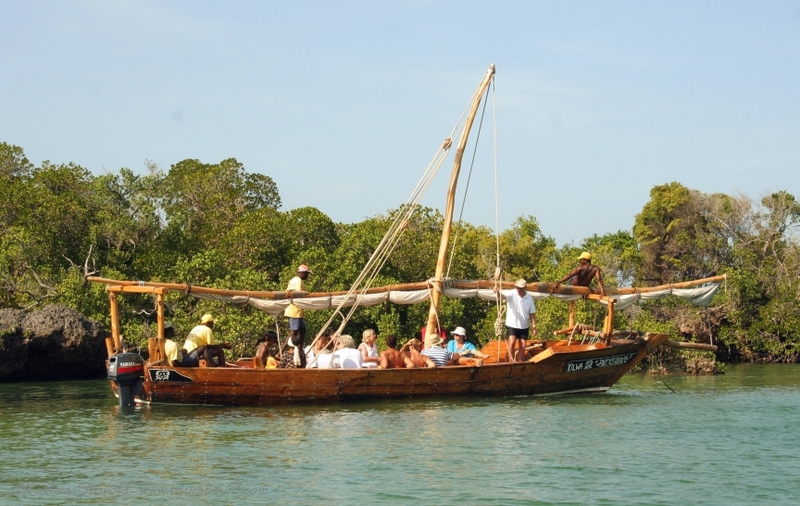 After bidding goodbye to Kwale Island (a place that now lives in dreams as my ideal paradise), we climbed back into the dhows and headed for a mangrove lagoon, where we swam a bit more in the lovely afternoon sun. Fellow Safari Blue adventurers in a neighboring dhow. Finally, it was time to return. We sailed back under wind power, as we had been doing through the majority of the trip, and enjoyed tasty beverages as we took in the view of the sun sparkling over the endless shades of azure. Everyone was relaxed and happy, if a a little sad to see the day come to an end. Getting from the boat to land was easier, as we put in at a sandy beach while the tide was high. We thanked our guide and walked slowly to the van waiting to drive us back to the resort. We had a lovely dinner with the full moon lighting a path over the ocean to our table. A perfect ending to a perfect day. Thank you, Safari Blue! The website says: "Safari Blue provides a high quality product with minimum impact on the environment, using the best Zanzibar has to offer… beautiful beaches, crystal clear sea, Swahili tradition, warm hospitality and good fresh food." We can attest that the claims are true! This tour comes highly recommended. Looks like an amazing experience! 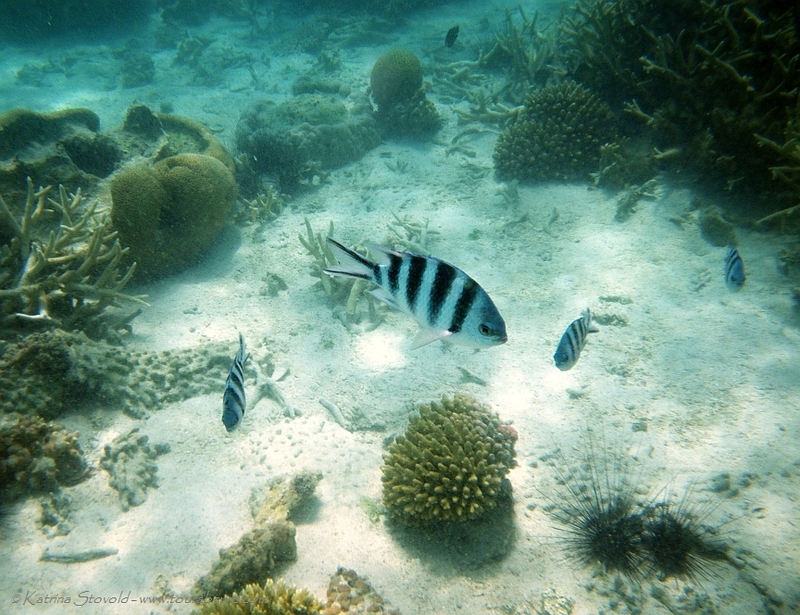 We love snorkling and have done it in quite a few places around the world (look for stories/videos about the amazing sights in Bermuda soon), but never in Africa. We're actually hoping to set up a trip to Kenya/Tanzania later this year for a safari, but I'd love to add Zanzibar to our itinerary. Thanks for telling us about the snorkeling there: I had no clue! Oh, yes, Bret! Do check it out. If you are into scuba diving, Pemba (the other of the two big islands that make up Zanzibar, the main one being Unguja) is known to have some of the best diving in the world. The day we went snorkeling there, the water was a bit cloudy, but Dario got extremely adventurous and took an abbreviated PADI diving course and went out the next day. He said it was still cloudy, but he saw bunches anyway. Have a wonderful time and let me know how it all goes! Uffff……I was right there snorkeling with you! The name Zanzibar has fascinated me since I was every so little. Definitely going to make notes of all this for when my pension finally kicks in! It's good to read good things about Africa too. There's been so much bad news of late, it's a reminder that it's a huge continent containing thousands of cultures, and problems in one country can be thousands and thousands of miles away from, say, Tanzania. Very true, Linda. You may enjoy a site that Phil, from Phil in the Blank, showed to me. It's called See Africa Differently. Their Facebook page sums it up nicely: "When you think of Africa, what springs to mind? 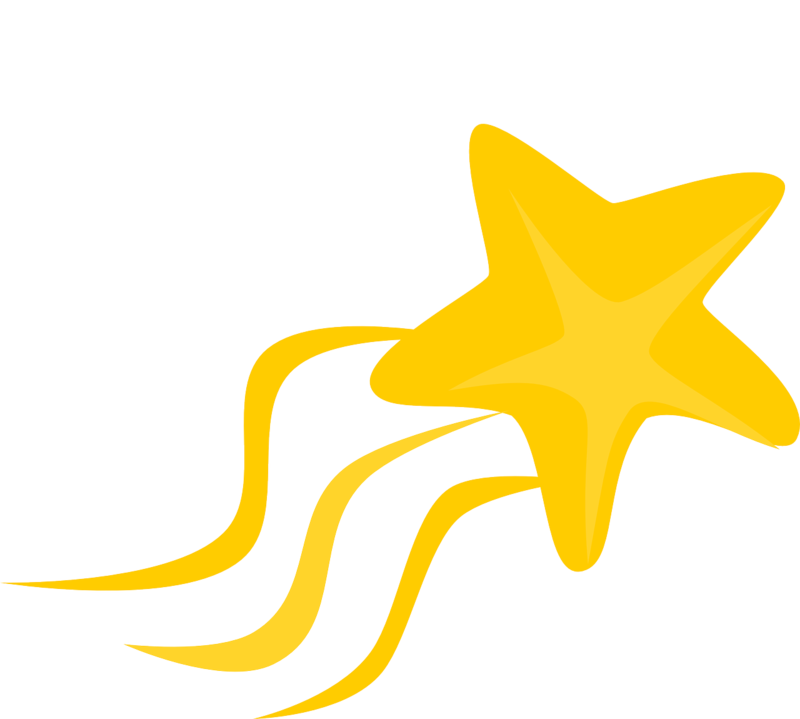 Do you think of Nobel prize winners, successful businesses and thriving agriculture? No? Then step this way…"